A biological switch that reliably turns protein expression on at will has been invented by University of Bath and Cardiff University scientists. The left-hand group has no gene editing RNA or BOC. The next group has BOC but no RNA, and the third has RNA, but no BOC. The right-hand group has both gene editing machinery and BOC. BOC activates the switch and non-fluorescent pups result. A biological switch that reliably turns protein expression on at will has been invented by University of Bath and Cardiff University scientists. The switch enables control of genome editing tools that might one day regulate cascades of desired genetic changes through entire populations. This new switching method should work for any protein in any species and uses a cheap, non-toxic amino acid as the control switch – the 'on' mode requires the presence of an amino acid called BOC. In contrast to other reported switches, this method does not use antibiotics, removing risks of selecting for bacterial antibiotic resistance, and neither is it ‘leaky’ – a situation in which proteins are expressed even when in ‘off’ mode, a problem faced by current methods that depend on temperature or light. The switch, an amino acid similar to lysine, is cheap, plentiful, non-toxic and should be environmentally-friendly. The research teams in Bath and Cardiff successfully demonstrated the switch in both cultured cells and in early-stage mouse embryos without any detectable target protein expression activity in the absence of BOC. The method extends a principle called genetic code expansion. To demonstrate the principle the team used transgenic mice carrying a gene that makes their skin glow green under UV light. When the genetic code expansion toolkit adapted for genome editing was present in embryos from the mice, their genomic DNA was efficiently edited to remove the fluorescence gene, but only when BOC was present. In the absence of BOC, no editing occurred. 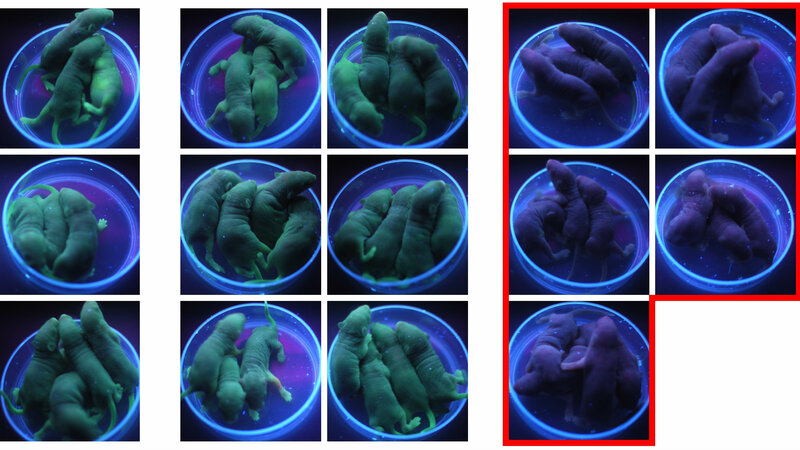 Embryos edited in this way could develop into mice that did not fluoresce, but without BOC no editing had occurred, so these mice remained green. The switch offers the potential to control a host of biological processes with the addition of BOC. These may include research and practical applications, in the laboratory test-tube, whole animals or both. For example, it might be used to address how certain proteins effect aging of cells in culture or animals. Clinically, it may provide a means to switch on proteins to enhance regenerative processes and could offer a new tier of control in gene therapy. One exciting potential application would be in using the switch in gene drive technology. Gene drives can use the CRISPR-Cas9 system in a way that ensures all offspring in sexually reproducing species inherit a particular genetic segment, overcoming the 50% chance of inheritance that sexual reproduction might otherwise confer upon it. Characteristics endowed by a gene drive can spread rapidly through a population regardless of whether or not they are advantageous – for instance trials have been done using gene drives to spread genes in mosquitoes that make females infertile, intending to crash the population of the malaria-spreading insect. However, multiple challenges must be met before gene drive usage is likely to be authorised. Once initiated, they are difficult or impossible to control and may work over wider areas than desired, for example straying across international borders. They may have unintended environmental consequences or give rise to resistance. Regulating gene drives by making Cas9 BOC-switchable promises to ameliorate these problems. Professor Tony Perry, who led the Bath team from the Department of Biology & Biochemistry, said: “Our switch is a way of controlling the expression of any protein via genetic code expansion. “What sets our work apart is the potential for this as an environmentally friendly switch across large distances, which no previous method really enables. For example you can imagine controlling gene drive activity in livestock herds by adding or removing BOC from feedstuffs as required. Co-author, Dr Yuhsuan Tsai from Cardiff said: "Although BOC provides an attractive and promising means to control editing, we are now working to address remaining challenges and iron out wrinkles in the system."